Datsun is a car brand known for producing affordable models for the auto enthusiasts. Although, its models are budget-friendly, the response they got in the auto market is not up to the mark, thanks to the poor safety standards. 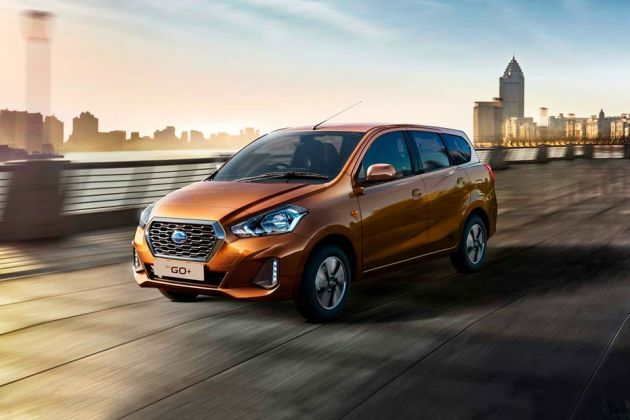 This made the company to introduce a new top end variant in its MPV series, which is as Datsun GO Plus T Option . This variant is now available with driver airbag as a standard feature. Apart from this, it has all the other features, which are already available in its T trim. The company has made no changes either to its style or to its specifications and kept the vehicle same as its existing variants. This vehicle is bestowed with an advanced drive computer that keeps the driver informed. It houses digital tachometer, instantaneous and average fuel economy, distance to empty, low fuel warning light, tripmeter and electronic fuel gauge. This variant is fitted with a 1.2-litre petrol engine under the bonnet, which comes with a displacement capacity of 1198cc. This motor has the ability of churning out a maximum power and torque outputs of 67hp and 104Nm respectively. Its braking and suspension mechanism is quite reliable that ensures a stress-free driving experience on roads. The company has given it a compact body structure, which makes it perfect for driving on city roads. To begin with, the front façade is designed with a honeycomb radiator grille, which has chrome surround. This grille is embedded with a chrome plated company logo in the center. It is flanked by a well lit headlight cluster that is powered by halogen lamp and side turn indicators. The body colored bumper has a wide air dam for cooling the engine. Its large windscreen is accompanied by a pair of intermittent wipers. Coming to its side profile, it has body colored door handles and outside rear view mirrors. The wheel arches of this variant are fitted with a set of 13-inch steel wheels, which are further fitted with 155/70 R13 sized tubeless radial tyres. Its rear end has a curvy boot lid, which is embossed with variant badging and black colored strip. The windscreen is integrated with a defogger and a high mounted stop lamp as well that adds to the safety quotient. This multi purpose vehicle is available in several exterior paint options for the buyers to select from. The list includes White, Ruby, Gold, Silver and a decent looking Grey finish. The spacious internal cabin of this vehicle is designed in dual tone color scheme, which gives it a decent look. All the seats are comfortable and covered with premium upholstery. The rear seat comes with foldable function, which helps in increasing the boot volume of car. The smooth dashboard is equipped with a few features like collapsible AC vents with silver accents, a glove box for keeping some small things at hand, an advanced drive computer and a three spoke steering wheel. The fully molded door trims and silver finished inside door handles gives the cabin a decent look. The company has given this vehicle a number of utility based aspects like cup holders, rear assist grips, front door armrests, interior room lamp, speaker grille and door map pockets. Under the hood, this trim houses a 1.2-litre In-line petrol engine, which comes with a displacement capacity of 1198cc. This mill is integrated with three cylinders and twelve valves based on DOHC valve configuration. It has the ability to churn out a maximum power of 67bhp at 5000rpm in combination with a peak torque output of 104Nm at 4000rpm. It is mated with a five speed manual gearbox with hydraulic clutch operation system. It allows this compact MPV to attain a top speed in the range of 140 to 150 Kmph. At the same time, it takes 15 to 16 seconds to break the speed barrier of 100 Kmph. The company has given this multi purpose vehicle an advanced braking and reliable suspension mechanism, which keeps it well balanced and stable at all times. Its front wheels are fitted with a set of ventilated disc brakes, while rear gets conventional drum brakes. On the other hand, its front axle is assembled with a McPherson strut with double pivot lower arm. While the rear one is equipped with H-type torsion beam mechanism. At the same time, it has a speed sensitive electric power steering system, which makes it easy to handle even in peak traffic conditions. This collapsible steering wheel supports a minimum turning radius of 4.6 meters, which is quite good for this segment. This top end variant is equipped with almost all those features, which are essential for giving a pleasurable driving experience to its occupants. It has an efficient air conditioning unit, which comes with a heater and keeps the cabin air maintained. Apart from these, this trim has also been equipped with a 12V power socket for charging gadgets, all four power windows with driver side auto down function, remote tailgate opener, follow me home headlamp, gear shift guide, headlamp leveling device and an advanced drive computer. In addition to these, it has a MDS (mobile docking system), which gives the access of everything what a smartphone offers. It also has mobile holder, Aux-in interface and USB port along with four speakers that enhances the ambiance of its cabin. This is the new variant in the lineup and is now available with driver aribag as standard feature. Apart from this, it has all other features, which are standard in T variant. The list includes 3-point ELR (emergency locking retractor) seat belts, driver seat belt warning notification and an engine immobilizer. In addition to these, this multi purpose vehicle is blessed with a central locking system, a high mounted stop lamp, rear doors with child locking system, rear defogger and many other such aspects. It also has a full size spare wheel, which is affixed in the boot compartment with all other tools required for changing a flat tyre. 1. Driver airbag is now given as a standard feature. 2. Compact size makes it easy to handle on small city roads. 1. There is still scope to improve its exterior design. 2. Lack of alloy wheels is a big minus point. డాట్సన్ గో ప్లస్ 5 వేర్వేరు రంగులలో అందుబాటులో ఉంది - White, Sun Stone Brown, Ruby Red, Crystal Silver, Bronze Grey. This is the best car. The looks are attractive. It is worth the purchase.